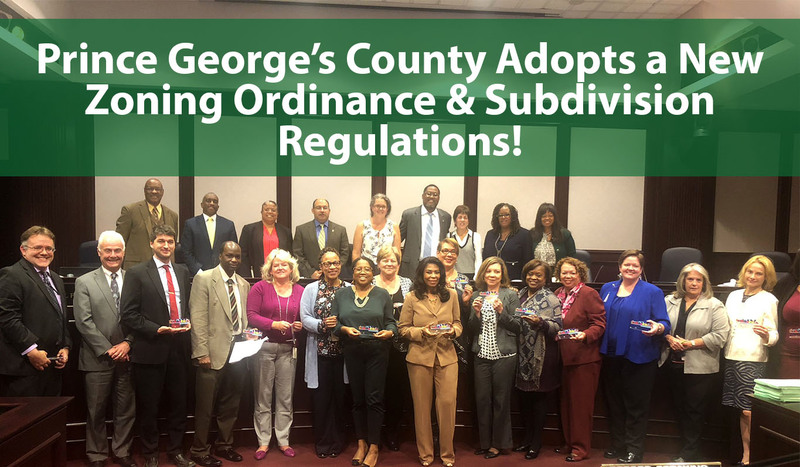 On Tuesday, October 23rd, the Prince George’s County Council voted to approve a new Zoning Ordinance and Subdivision Regulations for County. Updating the County’s Zoning Ordinance is a complex process, and one of the Council’s most important undertakings as the County’s land use authority. Council adoption of the zoning rewrite bills during Tuesday’s session moves the County several steps closer to a more concise, consistent, and user-friendly document, and better enables residents to play a larger role in shaping the future of development in Prince George’s County. CB-13-2013, CB-14-2018, CB-15-2018 and CB-65-2018, considered as part of the Council’s Zoning Ordinance Rewrite legislative process were all approved. The County Council and the Prince George’s County Planning Department have been conducting a comprehensive review process since 2014 of the County’s 50-year-old zoning laws, to update the Zoning Ordinance to support to the County’s vision for smart growth, economic development and improved quality of life for residents. The next phase will involve a County-wide rezoning process before the legislation becomes effective. To review the final legislation, visit the Prince George’s County Council Zoning Oridnance Rewrite portal at https://pgccouncil.us/589/Zoning-Ordinance-Rewrite-Portal.